As punishment its cabinet has been pilfered for parts and I'm considering using the (very good) monitor for a test fixture. Having an Arkanoid give its guts so that other games might live is quite appropriate, somehow. I got this game at the same auction I got my A.P.B., and the story is similar. I was in line ready to pay for the A.P.B. when the auctioneer declared that they were going to re-auction an Arkanoid that had gone for over a couple hundred bucks. I got it for $50 and was rather surprised. I have a soft spot for Arkanoid. It took in a lot of quarters but cost a lot of other games their cabinets. I have this idea that I'm going to rebuild the Arkanoid into a more traditional cabinet, but it's got to work first, and I need a cabinet, a whatever-to-JAMMA adapter, and even then I want to find a more general solution (qsome multigame cabinet). Arkanoid was usually a conversion game, but the cabinet here is quite odd. 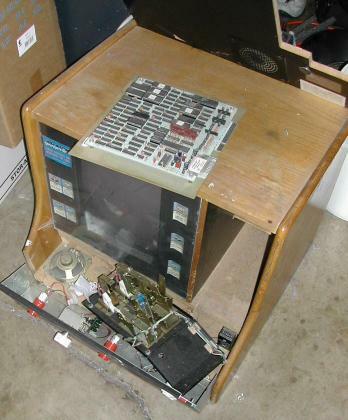 It's marked as a "Supertop" cabinet from Merit Industries, who have sicne moved on to the endless Megatouch games. Based on the fact that the panel is all metal, it might actually have been designed to take the generic Arkanoid board. I can't imagine putting anything else in it, the space for the board is just too small. Merit's web site has no information on this product, but given the date and shape on the cabinet I believe that it was built for Arkanoid or some other very small board. The unusual control panel overlay backs this up (most Arkanoids had ugly Romstar stuff there). I don't have enough hardware to secure the cabinet properly. No coin box was included and I have no way of locking the cabinet. Also the cabinet has taken to falling apart: the panel with the coin mechanisms falls over way too easily, and the quarters roll out the back. The wood on the left side of the control panel has been sliced off somehow, too. The board is tiny and the game had good graphics given the hardware, but cheap hardware, even by the standards of the day. I haven't found anything resembling schematics. The game has very poor diagnostics and nearly inaccesible DIP switches. At the moment the cabinet is serving as a sort of mini-table in my garage, given the stuff that's been piling up on it. Brian Kidder did manage to fix the spinner right after I got it, though, and it was fun while it lasted! Hopefully it will get going again. Arkanoid has no free-play mode. The spinner needs some good grease. The buttons have been replaced, but it's still mostly dead. The monitor is in good shape, though. Well, it was. Then I put it in my garage for three years and did not power it on. One day, I dragged it out to show it to Chris that the board had lost its mind. Instead, Chris said mice had eaten through the wires on the monitor's deflection coil and the monitor was marginal. "Let's fix it!" he said, and then, proceeded to do so, soldering four tiny wires back together. The monitor still has a great picture. Now I just need to get it in a cabinet that isn't crap. I ripped off one of the coin mechanisms to fix my Star Wars. (All my games are set on free play, but those mechanisms should work anyway for atmosphere!) I'm considering using the cabinet for an eventual test rig. Parting an Arkanoid, even one in an unusual, semi-dedicated cabinet, so that better games might live, seems like poetic justice to me.